It’s become a near-weekly thing to hear from our Empire State correspondent Tom about some Amish corner of New York. 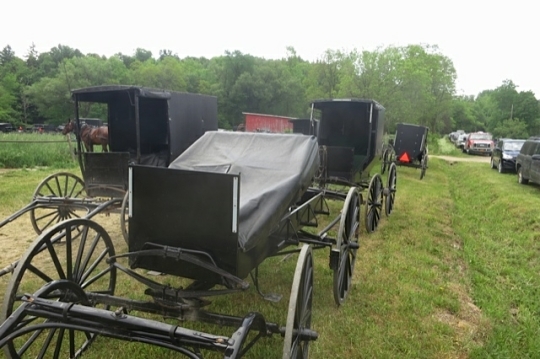 This week he checks in with photos of an Amish relief auction in New York’s Conewango Valley, the most heavily-settled Amish area in the state. 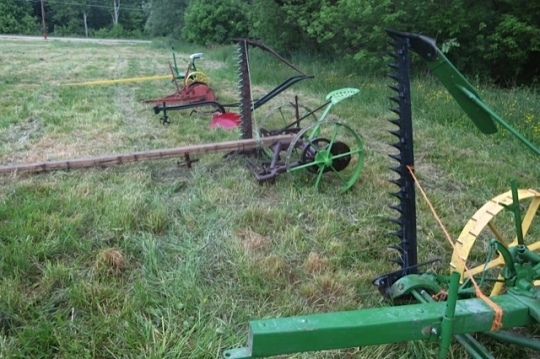 The auction took place in Cherry Creek, NY. 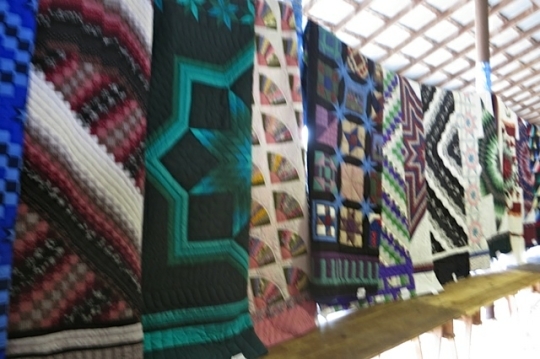 Amish quilts are a big seller. Uh oh, why did you put that last picture up there to see? 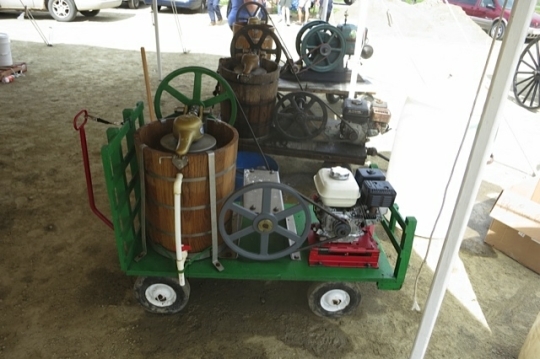 It is almost threshing season and when we got the shocks stacked, we often got ice cream. Mmmmm. Yum Yum Yum. Really hits the spot after a day of hard sweaty work. 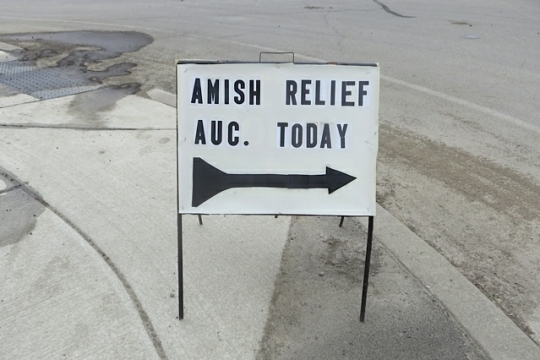 I feel a trip to Amish country coming on. I hope I time it right as I got a fresh homemade ice cream craving now! Thanks Erik! 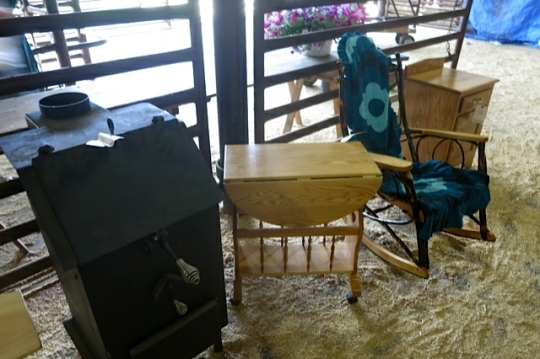 I am coveting that little wood heater. Those quilts are too fabulous. I want to go!!! 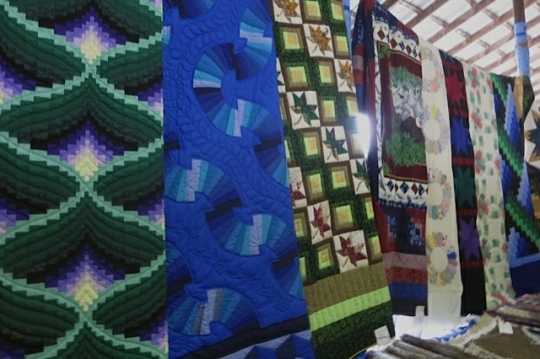 Beautiful things — especially the quilts! Thank you to Tom for the wonderful quilt and parking zone pictures. We can get the feel of being there. It is appreciated that you respectfully took pictures without people. 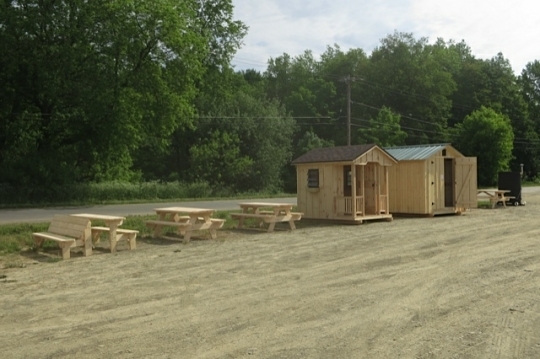 Selling picnic tables is a good idea. Only in the last year did I learn that the Swartzentruber buggies do not have a rear window. I am glad you enjoyed the pictures and that you appreciated that the pictures were without people. There could have been many wonderful shots of folks working and visiting at the auction, but I didn’t want to destroy my relation with the many people that I know. This group (Troyer Amish) are just a little more progressive than Swartzentruber Amish. There was a “sea of men with blues shirts and straw hats”…would have been a great shot. 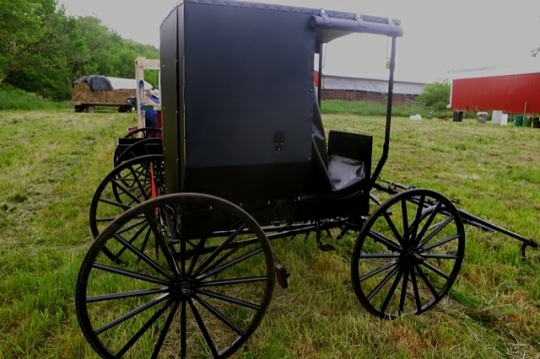 In today’s mail I received a thank you note from the Amish community for my support of the auction…makes me feel good. Tom I have to ask because I sense you are being modest–you got the letter in thanks, have you been helping them promote it, perhaps?…or is that in thanks for a purchase maybe (if I can ask)? Either way, great photos and thanks from this side for letting us peek in on the action. How interesting that would be to go to one of those!! LOVE THE QUILTS!!! AND the wooden furniture, etc….Will have to make time to attend one of these someday……we don’t have auctions such as these, down here in Florida — at least I haven’t seen any! I don’t know if you live far away or close, but it might be good to confirm the dates as they get closer. 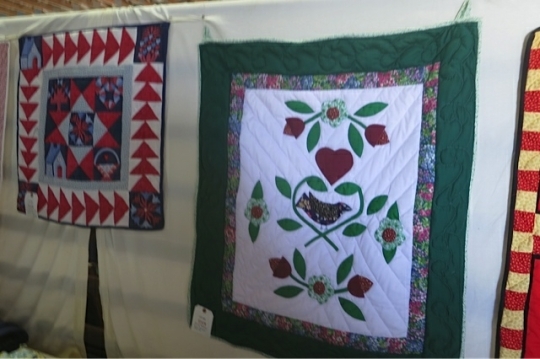 Thank you Linda, for sharing that info; ACTUALLY, we did go to Sarasota back in Feb. of this year (2012), and while visiting, Pinecraft, ran onto Palm Grove’s Amish Quilt Show & Sale, and went in and saw all of their beautiful quilts and other handmade items. Since it is a 3.5 hr. drive for us (we live on east coast of Fla), it’s one of those road trips, where we like to plan an overnighter, to enjoy it better. YES, it amazed me with all of the different patterns they had there!!! One of the ladies, did give me a “reminder” slip of paper, for Feb. 2013’s show/sale, and I have it on my desk! I did buy a small bag of “starter” squares that I am trying to find the time to put them together in some form or fashion. LOL.. I used to sew many years ago, so think I can at least piece them together, and see what happens next; since I do not own a sewing machine anymore, it will be “hand sewn”, for sure….I so admire the crafters that can devote the time for quilting and needlework. Might be the fact that I’m on the internet, spending too much time, “blogging” or surfing, when not doing my household chores! Thanks again, Linda, for you info. Great job Tom! You sure captured a lot of talent in those photos. Love the quilts. Tom, thanks for sharing these photos. My favorite has to be the one of quilts where there is one quilt that is a fan pattern in a corner square. My mom had a quilt top like that at one time; I was supposed to get it but it got away from me when she died. That pattern is “Grandmother’s Fan”. I love that pattern and wanted to bid on it, but I don’t need another quilt..I have too many already. In the topmost picture of the quilts, can anyone identify the quilt patern names working from left to right? I am particularly curious about the second quilt- the bright blue one with the wavy curves on it. It is lovely, as are all of the quilts. Am I correct in believing that the fifth quilt (cream/white background with the circles) is called “wedding ring”? Thank you for respecting the Amish people’s wishes not to be photographed. I am not sure of the pattern name of the blue quilt, I can find out. The cream with circles is a quilt top (would have to be finished with batting and back. It is “Dresden Plate”. Thank you, Tom. That is very kind of you. Iam planning to head to the library today to see if they have a book on quilt pattern names to see what some of the other patterns are. If I am successful, I can post other pattern names if anyone else is interested. 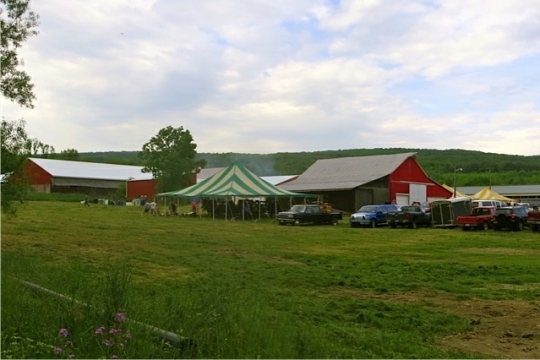 The annual New York Haiti Benefit Auction is scheduled for June 15 & 16, 2012, in Penn Yan, New York.